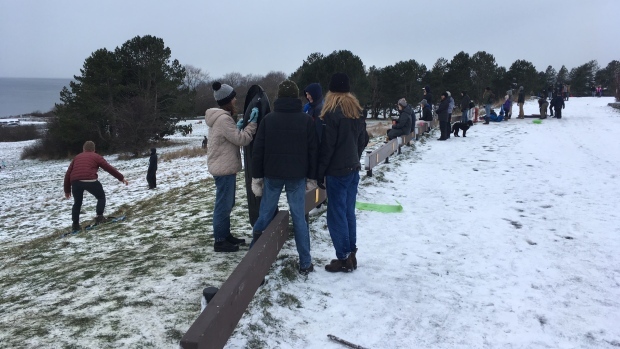 Squealing, screaming and laughter filled the frosty air at Beacon Hill park Monday as kids of all ages took advantage of a snow day. 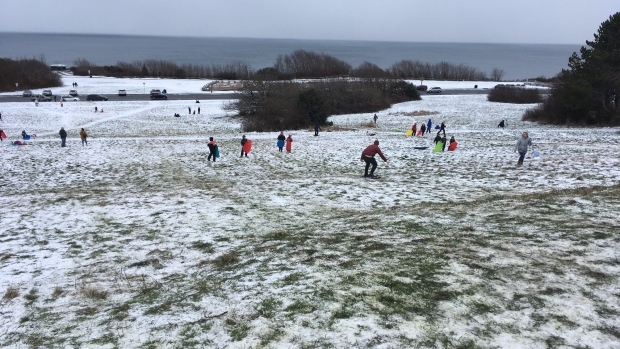 Dozens of families and kids were slip sliding down the somewhat snowy but icy hill. 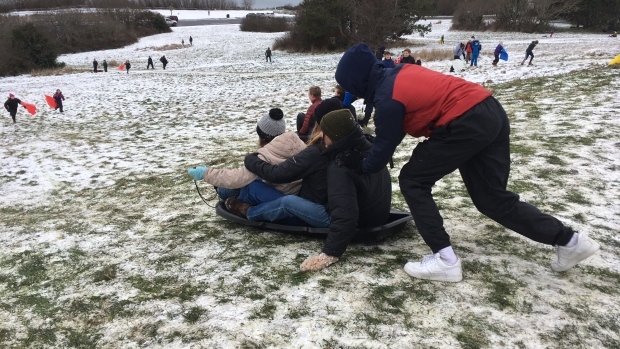 With schools being closed across many districts in the region, parents and kids were out in force enjoying the white stuff. Monday was the third day in a row out on the hill for one family. They said this was the best and cheapest fun you could have, so why not take advantage of the snow while it's here. Every thing from "magic carpets," toboggans and even a wheelbarrow without wheels were being used to descend the hill. With more snow expected, many of the kids said they would be back tomorrow if it's another day off school. Perhaps the only ones not enjoying the snow were the many daffodils that had begun to spring up. The flowers, ready to bloom, could be seen poking up out of the snow or flattened by all the tobogganers. 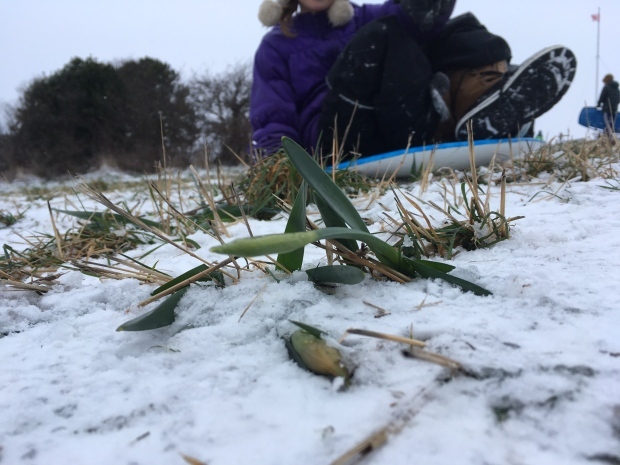 And with more snow comes more thrill seekers, something the daffodils won't be looking forward to. Snow was expected to fall Monday afternoon and throughout the evening. With that added snow will come much more fun on the slope of Beacon Hill Park and on other hills around the region. The sub-zero weather also turned Panama Flats into a skating rink, which proved popular with those trying to find something to do after school was cancelled. Teens were trying to play hockey on the Panama Flats and some even attempted to skate, but the conditions were far from perfect. Soft and soggy spots on the frozen surface were contributing to skates digging into the ice or completely sinking into the murky bog below. Some of the kids were still having fun passing a puck around regardless. 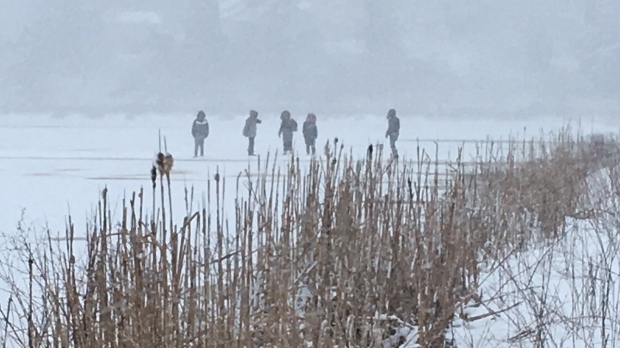 Most people were starting to pack up and head home after trying their luck on the ice, but there was still a steady stream of people dropping by to check out the flats just before 3 p.m.